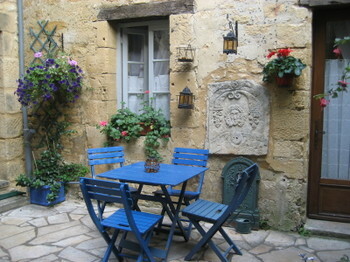 We picked up our pique-nique supplies in Sarlat, and got an early start on our canoeing trip this morning, heading out onto the Dordogne River before 10:00am. 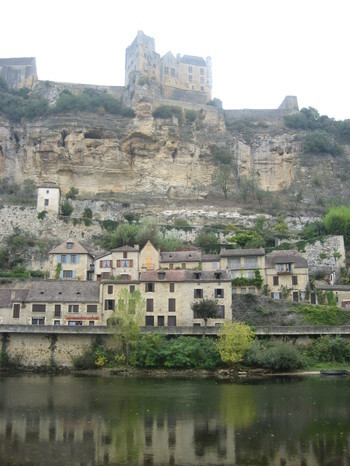 We rented our canoes from La Roque-Gageac (tél: 05.53.29.58.50) in the beautiful town of the same name. 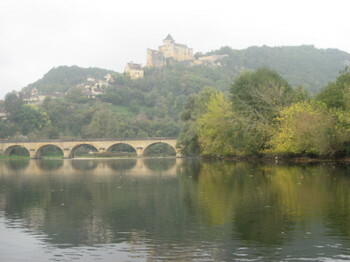 We weren't sure how the weather was going to hold up, and, apparently, others had the same concern because, as we found out later, we were the only ones who rented canoes today, so we had the whole river to ourselves for the three-hour journey. It wasn't until we had our two canoes in the water that Carol & Dean mentioned that they had never been canoeing before. 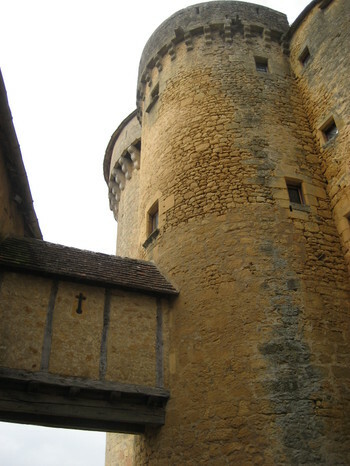 Fortunately, they figured it out quickly, and without mishap, so we were on our way to explore the beautiful scenery, under the charming bridges, past the ochre-colored buildings, and amazing castles. Since we were headed in the direction of the current, which is always the case here, it didn't take much effort to paddle the canoes. 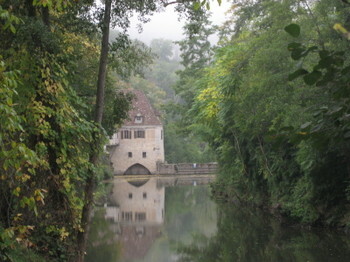 The main effort required is when you want to pull the canoe over to the bank of the river to stop. The current was much less forceful today than the first time Dave and I canoed here, so it was much easier to navigate our canoes than what we remembered. And it only took us one try this time to stop exactly where we intended to stop for our pique-nique with a view. 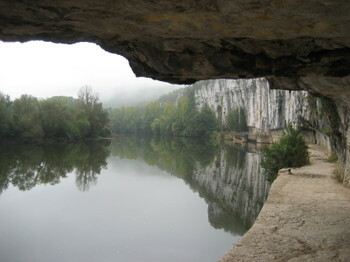 Our pique-nique spot was a sandy shoal just on the other side of the river from Château Beynac. 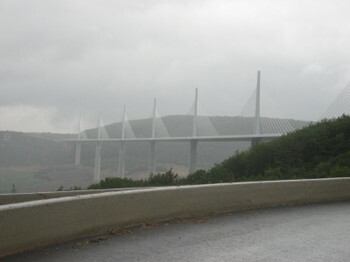 It wasn't until after we had reached the end of our canoe trip at St. Vincent de Cosse, and we were sitting in the van that came to take us back to our starting point, that the rain started coming down. 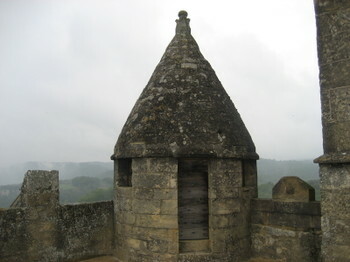 So, we got back to our car and drove up to Château de Beynac in La Roque-Gageac and decided that it was a good time to tour the 13th-century French feudal fortress. 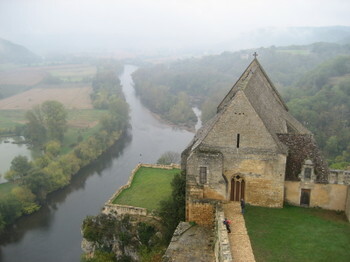 The Dordogne River was the border which separated the French from the English in the 13th century. 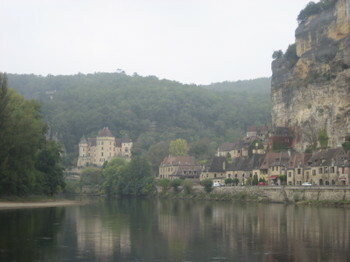 The north bank of the river held the French châteaux while the English châteaux were situated on the south bank of the Dordogne. 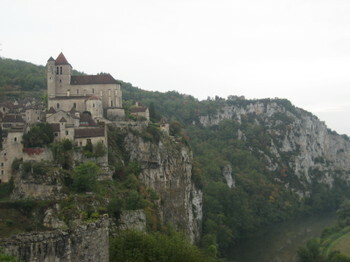 The most notable of the English châteaux on the south bank was Château de Castelnaud-la-Chapelle, which was the chief rival of the French Château de Beynac. 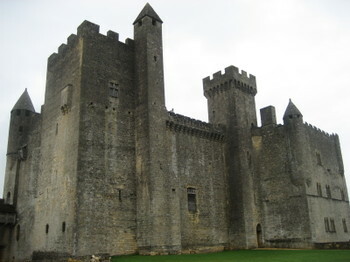 Ownership of the châteaux volleyed back and forth between the French and the English until around the end of the Hundred Years' War in the middle of the 15th century, when the English finally left France, and the châteaux all reverted back to French rule.